This product is full of ingenuity! I enjoy anything that makes my life easier and the 2 In 1 Towel Backpack by Tandem Active ($25.99) does exactly that. The large micro fiber towel can be folded into a drawstring backpack, which is one less item for me to carry and allows me to carry other items to the gym or beach. The towel is super soft, with well done stitching – which I pulled on to test the durability. It also does not shrink in the washer, nor does it lose its form. I didn’t place the towel in dryer opting instead to let it hand-dry. 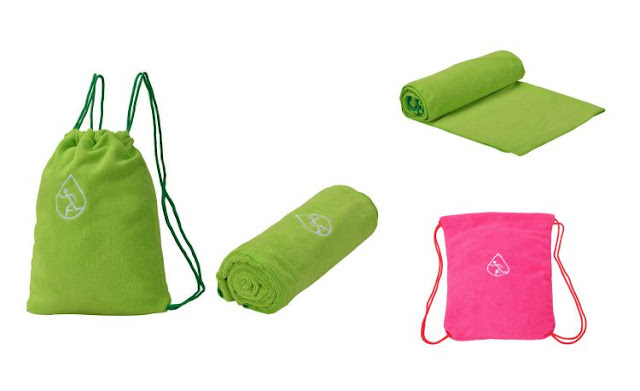 Versatile: This multi-purpose towel is the ideal towel for the active lifestyle, whether you are going to the gym, the beach, the swimming pool, boating, hiking, camping, Pilates, yoga, traveling overseas, backpacking or simply just to dry after a bath or shower, this towel will have you covered. Easily Folds Into A Backpack: I love this feature. When I go to the beach, I can carry all of my items in the backpack, unfold it and use the towel, and when I’m done pack everything back and move on with life! Highly Absorbent and Fast Drying: Made of 100% microfiber, this towel is absorbent enough for an active lifestyle and the microfiber dries must faster then cotton. Large and Compact: Size of towel: 55" x 30", Size of backpack : 17" x 13" - Despite this towel's large size it is still lightweight compared to the average cotton towel. Not only does it weigh less, it is also very compact when folded. You can either fold it into a drawstring backpack or just fold it normally like any other towel. The 2 In 1 Towel Backpack by Tandem Active is also available in pink and be purchased on Amazon!